Marco Milani lives in Milan, Italy. He is a professional photographer, specializing in photojournalism and outdoor advertising photography, especially in the mountains, and of mountain sports activities (trekking, skiing, free climbing, mountaineering, mountain biking). He has been climbing since 1980 and has made hundreds of ascents in the Alps, travelling and climbing in India, Pakistan, Nepal, China, USA, New Zealand, Malaysia, Norway, Algeria, Oman, Morocco, Iceland and Patagonia, juggling his passion for nature and mountains with his photographic profession. With the famous italian alpinist Alessandro Gogna he wrote four volumes of the series “I Grandi Spazi delle Alpi”, an 8 large format books collection describing the most panoramic treks in the Alps, published by Priuli e Verlucca – Melograno Editori. 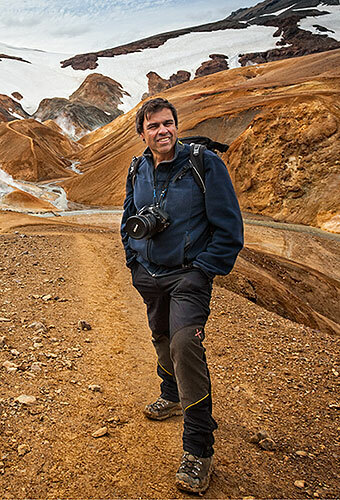 He is the photographic author of several books: Südtirol 360, Canavese 360, Le Alpi, Le Alpi Viaggio nella Natura (all published by Priuli e Verlucca). His photos appeared in many books: Le 7 Cime più alte del mondo (published by Fabbri Editori in italian, franch, german and czech), Montagne Cube Book (published by White Star), Les Alpes (published by Arthaud in franch), Le Alpi 7 books collection (published by Priuli e Verlucca for La Stampa newspaper), Omaggio alla Montagna (published by Mondadori Electa). He has also made several art calendars featuring mountain views. He collaborates with many magazines and his photos have appeared in Airone, Alp, Bell’Europa, Meridiani, La Rivista della Montagna, L’Espresso, Panorama, Oggi, L’Europeo, Famiglia Cristiana, Grazia, Lo Specchio, Sette, Gazzetta dello Sport Magazine, Berge, Alpirando, Alpes, Terre Sauvage, Bike, MBR, Tuttoturismo, D la Repubblica, Qui Touring, Newsweek.